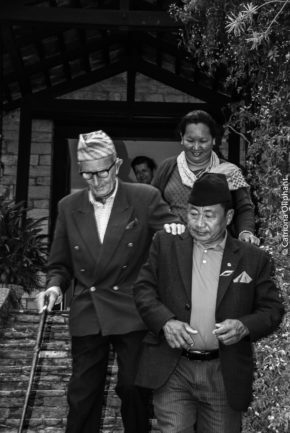 A Gurkha Remembers is the result of a very special collaboration. My thanks to John Cross for entrusting me with his story and enjoying the adventure. It has been enormous fun as well as a great privilege. 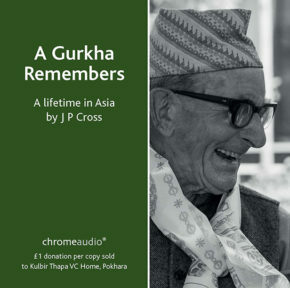 Especial thanks also to John’s surrogate family, Buddhiman Gurung, Bhim Kumari and their children for their contributions to this recording and for their generous hospitality when I was in Pokhara. Lt Colonel John Cross OBE has spent a lifetime in Asia – in and out of the army. Educated at Shrewsbury, ‘JPX’ – as he is affectionately known – joined the British army in 1943, aged 17. By 1944, he was at the Indian Military Academy in Dehradun, going on to serve with 1/1 Gurkha Rifles in Burma. In 1982, after 39 years’ service – nearly all with the Gurkhas – JPX retired to Nepal. for many years now, he has lived in Pokhara with his adopted son,Buddhiman Gurung, and family. In 2014, he was granted Nepali citizenship.